What is a Member Advocate? Hi, I'm Chris, also known at the Inner Circle by my Member Nickname "HeartHawk." My role at the Inner Circle is rather unique as I am involved in almost every aspect of things from technology to operations and working directly with everyone else on the team. 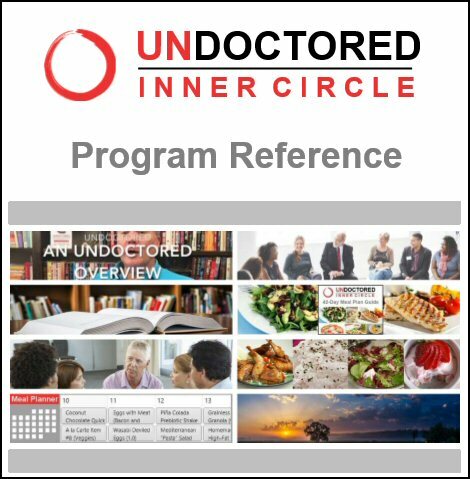 I have been here from day one and it's my job to know what is going on in every "nook and cranny" of the Inner Circle so I can help Members better understand, navigate, and utilize the Inner Circle website. The bottom-line is I not only "talk the talk" I "walk the walk" taking the same path as many in our Inner Circle Community. Taking personal responsibility for your health is crucial. A typical doctor must be able to treat thousands of different health conditions for thousands of patients per year. These numbers make it impossible for even the most conscientious doctor to remain up to date on the latest medical advances. Simple arithmetic also tells us that most doctors can spend less than one hour per year focused on your unique health needs. If you want optimum health, it is up to you to fill this "healthcare gap" and invest the extra time needed to achieve optimal health. The Undoctored approach helps make the job easier and more effective by providing access to information and a community willing to share their experiences. Keep in mind, taking personal responsibility does not mean "divorcing" your doctors. However, it is does mean changing your relationship with them. View doctors as your paid consultants, people you hire and pay to advise you on the highly technical and extremely serious issues affecting your health. Find good doctors and listen to them but keep in mind the good ones will always listen back! Unfortunately, not every doctor is willing to listen, understand your unique needs, and take unique action. My personal story is loaded with examples of how I might have suffered severe consequences - perhaps even death - if I would have been satisfied with the one-size-fits-all approach of traditional medicine - if I had NOT decided to take personal responsibility. Here are a few examples. After my mother died of a heart attack suddenly and without symptoms – the third family member to do so - I went to my doctor for advice and testing. I was told my LDL (bad) cholesterol was fine and not to worry. I asked about getting a heart scan and was advised against it. What my doctor didn't explain was that my HDL (good) cholesterol was also low and I never tested for an emerging and now known cause of early heart disease - high lipoprotein(a). I got a heart scan and found I had atherosclerosis and further testing revealed that, indeed, a genetic disposition for high lipoprotein(a) was the culprit. High lipoprotein(a) is difficult to treat but I have had some modest success using advanced treatments. But, I would never have known about the condition or the treatments without filling the "healthcare gap" myself. Most importantly, my relatives now know about the condition and can take action, the younger ones decades earlier! I saw my doctor complaining about extreme fatigue. Since hypothyroidism is a common cause for fatigue (and many other nagging ailments), he tested my thyroid using the standard TSH test and declared I was fine. Not convinced, I saw three endocrinologists before I convinced one of them to test me for auto-immune thyroiditis. You guessed it, I have confirmed auto-immune hypothyroiditis (Hashimoto's Thyroiditis) which I now simply and successfully treat (and not without more bumbling by traditional medicine but that's another story). During some personal, at-home, blood sugar testing, I noticed my post-prandial (after eating) blood sugar was rather high. I saw my doctor and he brushed it off saying that all my fasting blood sugar tests were perfect and besides, I was "too thin" to have diabetes. I came back a week later to show him more of my personal blood sugar readings and, after a little strong-arming, he reluctantly ordered an Oral Glucose Tolerance Test (OGTT). You guessed it, I am officially pre-diabetic testing only six points under the cut-off for full-blown diabetes. Of course, the Undoctored Diet helped improve things dramatically. I could recite many more examples but I think you get the picture. Had I not taken the time to inform myself on these various health issues and taken personal responsibility for my health I would be ignorantly walking around with no explanation for my extreme fatigue and with serious complications that would have elevated my hidden risk for sudden heart attack. Whether you do it through Undoctored or some other program, I strongly urge everyone to practice what I call Informed, Self-directed Healthcare (ISH). Take charge, become informed, then take action. You will likely feel better, live longer, and with less stress about your health!